Not sure what exactly to call it as our fishing season change, but we fish year round here in Nor California. For me, after my year end Tournament of Champions event it means its time for a little break from on the water fishing. I take this time to get a whole lot of work done. Its also my time to prep for the next years season. Inventory and organize tackle, freshen up hooks on hard baits, order product that I’m low on, boat service, truck service, what ever I feel I may need I try and get now. The first ting I ordered this year is a camper shell ands bed rug from Top This in Auburn California. The camper shell will allow me to better carry extra gear and baits. By doing this it means less trips to the local tackle stores which tend to take extra time as well as money. Not that Im against supporting the local tackle shop, quite the opposite, but I find stores near fisheries tend to be more expensive and they don’t always carry what Im looking for. It also takes away from prefish time, or boat and tackle prep time. So this year I pulled the trigger and made the investment to save in the long run. I’ll do more on the camper shell and Bed Rug once it is installed in the next few weeks. So, the next step is emptying the boat, truck, and all the brown paper bags and card board boxes. The cool part is I find all the stuff I bought that I forgot about or could not find. The bad part is it means I have to find a good place for it. Some items this is easy, others not so much. So i catorgize about 10 totes and start separating tackle into said totes. Once i complete this I can decide what needs to go where. The totes will be used during the season to load into the truck and making items that i need easier to find. I prefer to keep my fishing line in a inexpensive ice chest, this helps keep excessive heat and light from breaking down my expensive lines. 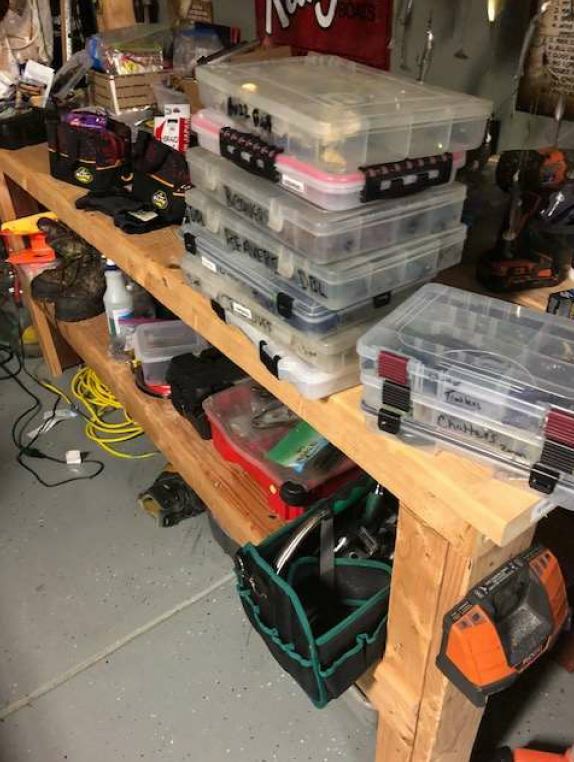 At this point Im usually stuck buying new storage boxes for new hard baits, and boxes that are breaking down. Seems the past couple seasons Ive been leaning towards the 3600 size boxes. They carry plenty of what I need for a couple days, take up less space, and are lighter because I am no filling a 3700 box with baits I don’t need. Not saying I don’t have 80 3700 size boxes because I do, just that Im transioning to the 3600 for a lot of the stuff I tend to use more. For instance the 3600 works great for a new worm box, and still carries a good assortment of colors. My favorite rattle baits are more comfortable in a 3600 as well, and they don’t get nearly as tangled because there are less in each row. At this point I pack the totes by category. These will differ for everybody, but some examples I use are straight tail worms, creature baits, trailers, senkos, and so on. Matter of fact this is how I carry senkos these days. Keep em in their original packaging and maybe combine 2 packs into one but its nice to see the color number if needed. I will carry 1 gallon freezer bags and put baits that I want to have with me into the bags and put into the boat. Now I don’t have to carry an entire 3700 box of worms when all I want is green pumpkin zoom trick worms.Speaking of Zip locks, they also are great for a medical supply bag, sunscreen bags, gloves, and energy bars. I do use an over sized box for accessories such as sharpies, scents, spare trebles and split rings, super glue, mend it, dip and die pens or bottles, and leader line. This is just something I keep in the boat of stuff i may want and there isn’t a great place to keep it. Well by now the tackle should be pretty well handled, although Ive got 3 full days into this year and Im not done. Thats why I do it now instead of when the season begins. This is also the best time to take care of the boat. Service departments are generally slower this time of year, and I don’t have to worry about missing a event due to boat maintenance or break downs. I will take my boat in to the dealer and get my service done. Once I pick the boat up it goes in to California Auto Tint and Polish in Campbell Ca for a detail. Bobs crew does an amazing job and I will only go there after being disappointed to many times. There is a detailer near you that takes that kinda pride as well and its worth it in my opinion. It makes it easier to clean throughout the year if I start off with a boat that looks new. 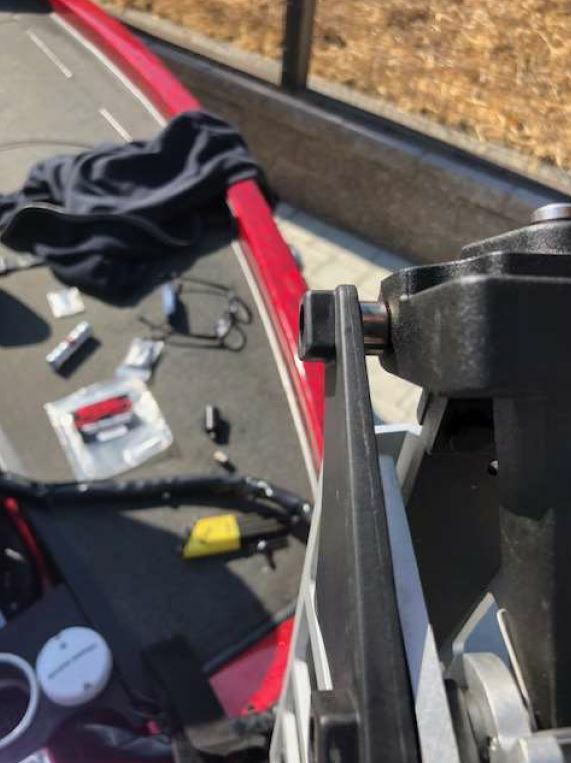 I also installed a new Red One Systems trolling motor cable on my Ultrex so I am worry free with that. Ordering tackle at Monster Fishing Tackle is a must. I order now because I don’t want to have to depend on getting that hot bait when that bite is on. Monster has a ton of great stuff, but like any retailer, when a bait is hot they may sell out of what you want. That said , my orders are in and already delivered. I should have plenty of A rigs and swim-baits to get me though a few months. My bed fishing and prespawn baits are well stocked and ready to catch some giants. I will be figuring out my oil needs and placing my order with Amsoil in the next month. Again I try and make it a one time deal for the year. For those that don’t know Amsoil is the only company to make a full synthetic oil for my G2 other then Evinrude at basically half the price. If like me and you are running a 2 stroke check out Amsoil. If you need a place to purchase Ill be happy to help ya out. So while this is a lot of work, its well worth it to me. When January rolls around Im busy fishing, attending fishing show, and fishing tournaments. Since everything is done and handled IM ready to go and I know Ive done everything I can to make for a better day on the water and less down time. Now is a great time to visit Monster Fishing Tackle and stock up. Many sales between now and the end of the year to save money on your favorite baits. Don’t forget Black Friday. Also check your closing, rain gear needs to be checked so you don’t have a miserable day due to defects or damage because we didn’t check it.